I Love You More Than Carrots: Operation: Ditch The Nunnie (Pacifier). It was a spur of the moment decision. I laid down alongside you in bed, like I do most nights, and as you asked for your "usual's," Hippy, water and your beloved nunnie, I took a deep breath, prepared myself for ensuing toddler wrath and explained to you how I thought we may have left all of the nunnies at the beach house. That we didn't have any more nunnies in our house here. I waited for the tears and as your mouth turned down at the corners and tears began to prick your eyes, my heart began to ache. I quickly ran my fingers through your curly blonde hair and asked you not to be sad. I asked if you thought that perhaps you could try going to sleep without your nunnie tonight. That maybe you could hug tight your animal friends instead. You took some serious time to think about my proposition. You glanced around your bed and fingered Hippy and Puppy. You patted Mister White Bear's head. Then, you looked up at me, so sweet and thoughtful and brave and you said, "OK, Mom. I do it." I squeezed you so tight and as I did, I could feel the lone nunnie that I had tucked into the waistband of my pj pants. The one that I tucked there just in case. Just in case you weren't ready. I would have pulled it out in a heartbeat. But you are so brave. And smart. And so big. You continue to amaze me. I promised to take you shopping for a new toy in the morning. We talked about what you would buy. Maybe a train or a truck. Maybe some water balloons. This was much harder for me than for you. It was the last hint of baby about you. My first baby. The one who made me Mama. Now you're a boy. Not just any boy, though. You're my sweet big boy. My heart. 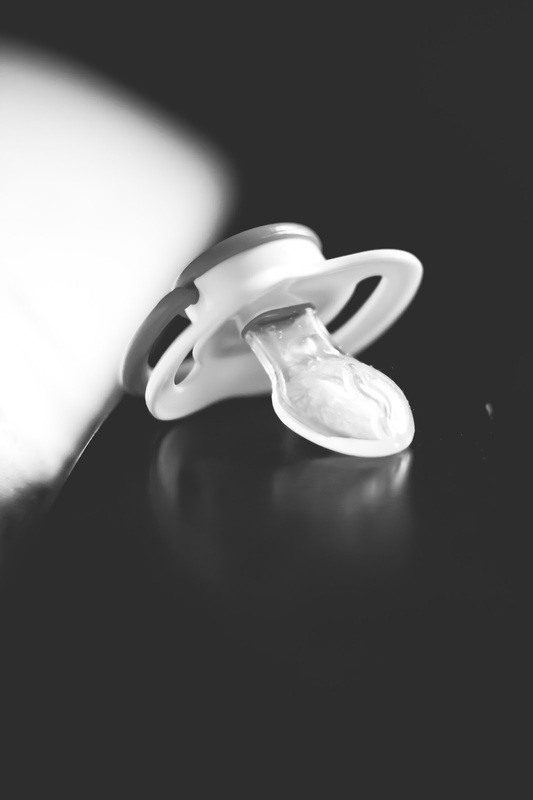 - I had "planned" to take away the pacifier when Carter turned two but being as that was only a month after his brother was born, I didn't want to drastically alter his world any more. Not to mention that I didn't want him to think it was "ok" for the baby to get a pacifier but there he was being punished for having one. So? We kept it. - Carter turns three next week. I wanted and knew that I needed to wait to try this until he could reason and understand a little better. Any earlier and I know it would have resulted in tantrums and tears and again, it wasn't hurting anyone. So? We kept it. - He has done so awesome. The next morning we drove to Target after breakfast and we talked about how he gets to pick out a toy because he's a big boy and the nunnies are "all gone," emphasis on the "all gone" part. He slept through the night just fine, never waking or asking for one and he went the entire next day without searching for or asking for it. I have my doubts that it could really be this easy- but so far, so good. One day at a time. I'm trying not to stress the poor kid out! - The next morning when I was explaining all of this to my mom on the phone- talking about how proud I am of him, etc. I started crying. Seriously. I am such a mom. - If we return to the beach house and he remembers that's where we allegedly left all of his nunnies, we'll cross that bridge then. Of course we'll look all throughout the house and we won't be able to find them. Hopefully that will be enough. Maybe we'll just blame the cleaning lady next. I'm kidding. What a big brave boy he was to go to bed without his beloved Nunnie. It made me sad to read it. I have a feeling my conversation will be something like this in several months "How about we dont nurse tonight" followed by a dramatic temper tantrum as she tries to rip the clothes off my body!" Yup, I have set myself up for disaster. Awww what a good boy! My mom kept my brother's pacifier for YEARS "just in case". She found it when he was like, 15. Haha! Me on the other hand, I just tore mine apart one day and that was that. I'm wondering what you will do if Carter remembers the next time you're at the beach house? We did the pack fairy... she came and got the pacis that B left on the front porch, and replaced them with a special new Thomas train :-). Worked like a charm at just under 2 yrs. So glad your transition has been smooth thus far. My son is 19 months and still uses the paci to sleep and when he's really upset or hurt. I've said I'll take it away when he turns 2 but we'll see, hopefully it will go as well as it has for you. better to blame the cleaning lady than the dentist! LOL! Good job Carter!! And good job AP! Like I said on IG we did this maybe 2 weeks ago. I just told Savannah that her binkies are all gone because they are for babies and she's a big girl! (She turned 2 yesterday). She was upset (a little) at first, went looking for them in the morning, but otherwise no tears and it's been surprisingly easy. For her...for me? It was the toughest decision I have had to make in parenting. I hated it and it made me so sad...I still can't figure out why, maybe it's because that was truly the last "baby" left in her (minus the diapers). Who knows. It's amazing what these kids can handle, huh? way to go mamas big boy! Ok, so I am over-emotional to begin with. Add being 35 weeks pregnant...welp, the hot tears are rolling down my cheeks. This is just the sweetest letter. I'm pretty sure I reacted the same way when you posted on IG bout leaving C's nunnie at the beach house. Elena just turned two and we decided to wait a bit to take her paci (which is only used for naps and bedtime) away, especially with little sister's impending arrival. I'll remember this sweet letter, and your strength, when our time comes. Thanks, AP. waaaaaaaaaaaaaaaaaaaaaaaaaahhhh...OMG...this made me cry. My daughter wouldn't take the pacifier, but still, this was so beautifully written AP!! Good job little man (and his mama!). I applaud you for waiting until the time was right for YOUR family not what everyone else thinks. This story may come in handy when Sawyer needs to get rid of the Wubby. My daughter just turned two and to say she is attached to her paci is an understatement. I'm being urged by my ped to wean her from it but I feel like she's just not ready (or maybe it's just me)! How did you handle "unwanted orders" from your ped, assuming you we're in the same position? this is so sweet! :) Give C a big high five from me! Congratulations to you and your big boy on reaching this milestone!